First, great customer service … ordered Friday, got Monday. Okay, so I\’m comparing this Bible to the Allan NASB I got and promptly gave to my wife. Nowhere near as elegant … doesn\’t have the love-to-pick-up-and-handle factor like the Allan. But you can buy six of them for the price of the Allan … just saying. At 32.47, one of the best buys at EB. The genuine leather feels good to the touch on the outside, but the inside cover is stiff paper, so lacks flexibility … hopefully will get better as it ages. Text block is identical to Allan, although trimmed out a bit differently … slightly smaller, tiny bit less margin at top and bottom, giving it a more crowded appearance on the page. The text runs more into the gutter on the inside, to…o, though that may just be a factor of the Allan opening flatter. As others have pointed out, publisher calls this \”wide margin\” but it is not (nor is the Allan) … enough space for a few notes, especially where the side references are sparse. One cheap-looking black ribbon instead of the Allan\’s three. 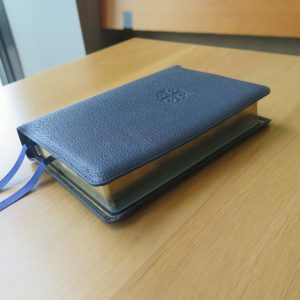 Bottom line: good value for the money, does not really compare to the Allan or my other \”luxury\” Bibles (Crossway calfskin ESV SCR and large print) in quality … or in price. Thank you to Mark Frees for his wonderful review of this bible —coupled with the very reasonable price it finally got me to make a decision to order. I received this Wide Column Reference NASB updated edition in one day- Im in Virginia too  still I was so happy getting this quickly. I sought to replace my 4 lb NAS Harvest House International Inductive Study Bible that Ive had for 14 years. Wow, I was so out of touch with all the new bible versions. My doctrinal pastor teacher teaches from the original languages in an exegetical (grammatical), isagogical (historical) and categorical method. He recommends the NASB so I knew I would stick to that for study. Daily study of the Word of God is the most important thing I do. Back to this Bible, I love it. I had a long list of things I wanted and this fills many of my wants, all of my needs and has a great price to boot. I still want an Allan NASB but do not have the money right now and for my wrist health I needed to get a smaller lighter weight bible. I am happy with the quality, the readability and the fact that this bible is smaller weighing half of what my old bible does. I began transferring some notes over and highlighting some and know that this will be a fun project. I highly recommend this bible and evangelicalbible.com. I just received this wonderful bible. Top notch for the cost, especially being a very soft genuine leather which I believe to be a cowhide and not berkshire(which is much more stiff). That being said, you wont find a more high quality bible for the price. And one of the greatest formats in the side column reference in verse and black letter. Cant go wrong with 11 pt font. Extremely readable. Ecstatic about this purchase. In my opinion the NASB is the absolute best translation in english (much better than ESV) using the underlying critical greek text. Whereas the NKJV is the best using the TR for NT greek text. If you want the 2 best bibles in english, these are the tops. Unfortunately, this bible had a binding and glue up worse than some of the books I used to get in the 50’s that were printed in the USSR. The back was not glued-up properly since the the glue was applied “cover-side” and thus the book “floated” and began to separate from the cover. The entire thing wasn’t even substantial enough to send to a bindery for a new cover. I have sent it to The Lockman Foundation with an appropriate comment on their PRC production facility and did not ask for repair or replacement. Perhaps they will amend their ways. It would be edifying if EB would inform folk of the PRC-origin bibles, so that Christians are not unknowingly supporting the slave labor so common there. I don’t know that the Lockman production facility has safety nets surrounding the buildings to prevent suicide jumpers, but it is something to consider. Obviously, the lure of PRC based business ventures is that very cheap and essentially “forced” labor. I would not have noticed the PRC thing except the product was defective. I will be more careful in future. First, this is a large “full-sized” bible. I have had two of these NASB’s in this format from the Foundation Publications, Inc. over the years. They are the 1977 version (with Thees and Thous) and in hard cover. One is still in good shape, the other totally came apart and wore out but after many years. So, I decided to try one of these leather 1995 publications. It is a bit larger in paper size than the older one and it takes an additional 10 pages for the Old Testament. I don’t know why, the font size looks about the same, and the pronouns are shorter. It looks like many two-line verses in the 1977 are only one line in this 1995. I like this bible except for one main thing. It has half the map pages of my 1977 and the maps in this version are on high-gloss paper (the older ones weren’t) and the info on the maps is poor and incomplete. For example: The map for the twelve tribes in the Promise Land has very few annotations. Take the tribe of Asher for instance. This bible has only three towns/cities identified and my 1977 map has thirteen. In a word, the maps are pathetic compared with what was provided in 1977. So, why didn’t they use the same old great maps? I doubt the history changed. I looked at those maps a lot in the 1977 version but don’t have much interest in them now. I deduct a star in the rating for this. Also, the pages were easier to turn in the 1977 version. Your thumb could just flip through them to where you want to go, like most books. Not so, now. The pages stick together a bit at the edges. I guess these changes are all in the name of “progress”. Oops, there goes another star. If you’re interested in this translation and layout I suggest getting the Genuine Leather edition instead of the Calfskin. The Calfskin is beautiful and soft, but the way it is bound looks quite shoddy and unfitting for such nice leather. It has edge-lined binding just like other high end Bibles (Allan, Schuyler, Cambridge) but it is incredibly loose, like the leather is ready to fall off. The tabs of the edge-lined binding don’t match all the way to the top of the text block, creating such a wide gap at each end of the spine that it looks like it was bound incorrectly. I originally returned my first copy and got a replacement only to find they all look like this; the huge gaps are somehow intentional. Also, regarding the cover being loose, there’s a much wider gap in the spine (between the cover and the text block) than I’m used to seeing in well bound Bibles. 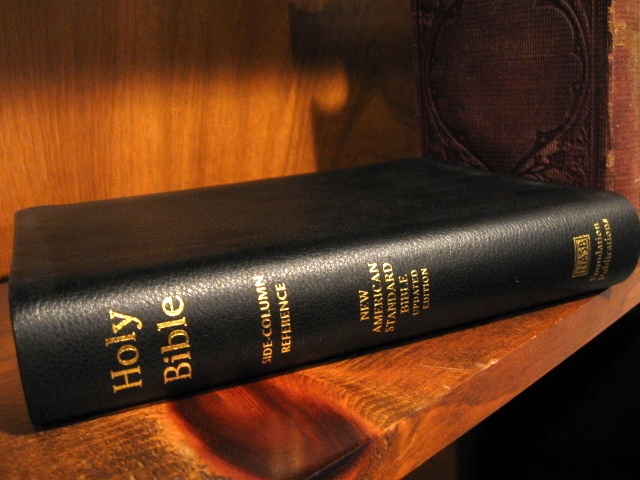 In the pictures it looks like the cover nicely follows the pages when the Bible is closed; this isn’t the case at all. Even closed there is a rather large gap at the spine. Does a loose fitting cover affect durability? I don’t know. But it looks cheap. The Genuine Leather edition, however, is exactly how it looks in the pictures. 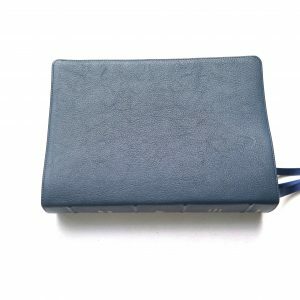 It (like the Imitation Leather edition) uses a paste-off binding instead of the edge-binding and executes it wonderfully. The leather feels great — far better than I’d expect for a Bible under $40. And it has a nice, snug fit and it lays open from beginning to end. I’ve owned this bible for 6 months and am still trying to break in the cover. It’s just too stiff for my liking and fanning through this bible to find a passage is slow and awkward. The feel of the leather is rough. The map and presentation pages are also very stiff and glossy. It just doesn’t handle well for me. Now, that being said, it seems to be very well made. I like the single column text, the font size, the wide margins, the side reference, and most everything else about it. It has a wonderful uncluttered, easy to read format. It lays open nicely. Although a few people said the calfskin version felt flimsy, I probably would prefer the feel of it. For $35 this bible is a good value but I’ll have to upgrade at some point to one that is more flexible and has a better feel to it. 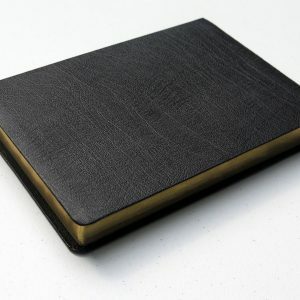 got my bible on saturday as scheduled..however, horrible ghosting the bleed thru is horrendous and very stiff it obviously isnt genuine leather very disappointed yet again in lockman….. I love the format of this Bible. Within three days of buying I already had written a decent amount of notes. The Bible also started falling apart during this time. The text block was separating from the cover & some of the signatures were starting to protrude. I was surprised & disappointed. I will not attempt to buy this Bible again. I also had trouble with the lput that had loose binding to the text & had a bluish tint to the paper. I will say this, the customer service here at EB is excellent. I received a refund for both Bibles. The problem was addressed quickly. So, I am thankful for that. You’re better off trying to find an older print with this format printed in the US not China. My first point on review is that customer service blew my expectations out of the water in both friendliness and honesty! I’m currently serving abroad and needed a reliable and durable wide-margin NASB with large font. So I contacted customer service for their recommendation. I had two other options in mind, but customer service informed me that this format – which was cheaper – had been singled out by other reviewers as being very durable. I was so impressed they met my needs instead of trying to sell me something that wouldn’t last as long. The cover is nice. I can tell that it will wear quickly on the outside and begin to crack around the edges, but the construction is very solid and I think it will last a long time even if it does show some wear. The words “Genuine Leather” and the ISBN are printed in gold lettering on the back, which is my only strike against the format, but this is negligible in my opinion. The binding looks well done and when it opens there no crackling sound from the binding, which I’m told is a sign the binding was poorly done. Though there is space between the cover and spine when it is open, that doesn’t bother me at all. What is most important is that the binding feels very durable and still feels quite tight after coming with me through lots of travel and enduring a lot of study time already. The paper is thin but appears durable; I do not expect the edges to wear out as quickly as my last Bible did. I use a light blue pen and special plastic crayons to mark in my Bible, and there is no bleed through from my notes. But without “line matching”, you can notice some bleed through from the font on the next page, though it hasn’t been enough to interfere with readability. This is my first single-column Bible and I am extremely pleased! The single column makes note taking much, much more efficient. It may actually be hard for me to go back to double column! The font is very clear and sufficiently large that I can read for hours without straining my eyes. Next to durability, this is the most important feature to me. I am very thankful not to be distracted by headaches anymore, which frees me up to concentrate for longer periods at a time. I love the verse-by-verse format; it makes finding references so much faster. But what I absolutely love about this Bible is that they “bold-text” the verse numbers that mark the beginning of new paragraphs! This means you don’t lose access to the valuable exegetical insight of where each verse fits in the contextual flow of the book. In fact, I recommend reading the “forward” and the “Explanation of General Format” in the beginning to get the full features of this NASB’s format. Because I travel, finding a case to carry my Bible in that will keep it safe is very important. 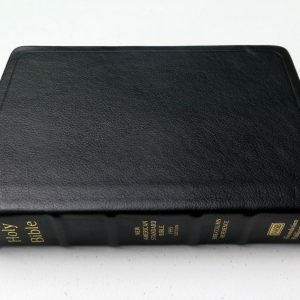 The box that this Bible comes in is made of sturdy material and with some scissors, gorilla tape, and ingenuity, you can turn the box into its own carrying case. This is how I keep the Bible from getting crushed in my backpack or suitcase when I’m traveling. 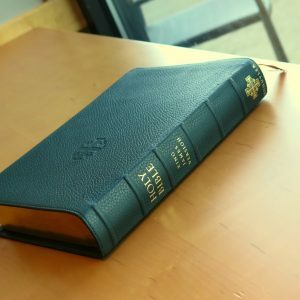 Overall, having traveled across the pacific ocean, and spent quite a lot of time studying this Bible, I could not be more pleased with the durability and features of this Bible. In my view, there’s very little room for improvement! I bought this and the LPUT both in Genuine Leather, though not from this store for shipping cost reasons (Canada). The leather is different from the LPUT and SCR, the SCR is a little more flexible and smoother and the LPUT is rougher and slightly stiffer, I like both, they’re both durable leathers. The 2017 prints were anticipated by NASB fans because they thought Lockman was going to improve the paper quality and binding. I’m not sure if the binding was improved, mine haven’t had any issues though I’m donating the SCR. The ghosting is still terrible, even after the new paper and new printing. I said the ghosting is terrible though, not the paper. Believe it or not, the paper with this terrible ghosting is actually a nice paper, smooth, no glare, takes ink well (no bleed through) opaque. The thing is that doesn’t matter if the ghosting is almost unbearable, this is why people dislike these Bibles by Lockman, they went from using the best paper I’ve ever seen (early 2000’s and 2007) to the worst. I’m sure the issue isn’t as easy as this to fix, but the solution appears very simple. Line match. They need to get with the program, everyone is line matching these days which improves the reading experience exponentially when you’re dealing with paper that ghosts, which most Bible paper does now due to production cost. 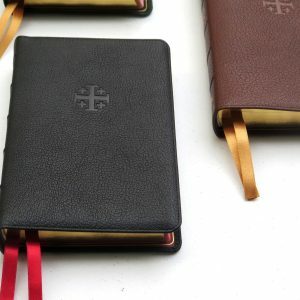 Honestly, if Lockman would line match these Bibles, especially the SCR, it would make a WORLD of a difference and I myself would use the Genuine Leather SCR as my main Bible hands down. It has everything I like besides red print, but due to the ghosting which is extremely distracting to me I don’t use this. Overall, very disappointing in this way. Now we have to wait several more years to see if Lockman will clue in when they’re ready for another printing, maybe they’ll do a better job with the 2019 revision production. 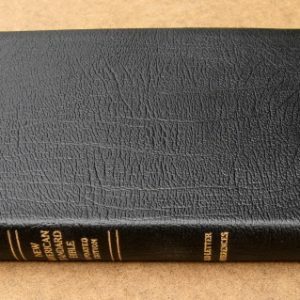 I’m very pleased with my Lockman NASB Side-Column Wide Margin Reference Bible in Black Genuine Leather. This is excellent value for money. I have a 2017 printing, the paper is crisp and very ligible. The generous 11pt font is easy on my eyes, and the verse by verse single column format reads very smoothly and for me reduces eye strain considerably, reading 3+ hours per day. There’s as much ‘ghosting’ as I’d expect in a cheaper bible without line matching. The robust side margin references, combined with the concordance leave me little reason to consult my strongs concordance in most studies. If I decide to use the outer margin, there’s plenty of room to write additional cross references, not really enough to say I could make notes. 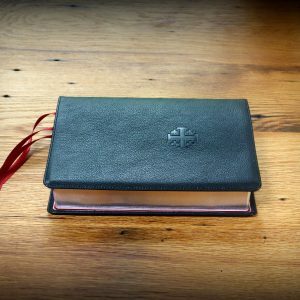 The genuine leather is pleasant and flexible to hold, being MUCH softer and far more flexible than the Lockman thinline refererence bible in black leather, which is like holding sandpaper and stiff as a board… not the case with this bible. The lining is strong but fairly flexible, some type of synthetic, not paper. 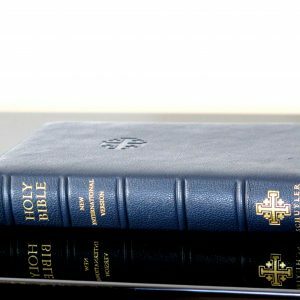 The bible lays extremely flat right out of the box, even when reading in Genesis and Revelation! For $35.00 I was pleasantly surprised by this. The only feature I have a complaint about is the cheap, poor quality ribbon marker, this would be substandard in a $10.00 bible, however, I use homemade bookmarks and have little use for ribbons, and overall this bible is such good value I’m still giving it 5 stars despite the ribbon. Make no mistake this is not a small bible, nor is it a $200 bible… as advertised. Using the outside cover for measurements, mine is 7″ x 9-5/8″ x 1-3/8″. If you’re looking for a small bible, buy a small bible, not this one. 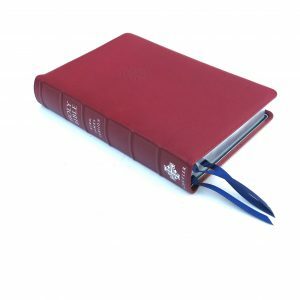 If you’re looking for a well bound, comfortable to the touch, easy to read, robust reference bible for inductive study; this is it, and at a great price! I’m a missionary abroad and was looking for a Bible that was durable and could handle a lot of study without breaking down and losing pages and I’m very pleased. I’ve had this Bible for a year and use it for all my expositional Bible studies. The cover is good and has held up to quite a lot of use. I converted its box into a carrying case to add extra protection while its in my backpack, but the cover has still taken quite a bit of wear and held up very well. The binding is holding up better than I expected. I don’t see any tearing or loose pages yet. The pages are slightly thin, which makes them susceptible to crinkling and ghosting, but they aren’t ripping yet. The pages have been able to handle writing and highlighting without tearing. I’m seeing no discoloring yet and the pages do not curl. I love the wide-margins with verse-by-verse format; perfect for expository style preaching. New paragraphs are indicated by bold-font verse numbers, which help you not to lose track of macro-patterns. The references are next to the margin instead of in the gutter, which I would have preferred, but I have adjusted and don’t even notice it anymore. This Bible is something that you can count on lasting through quite a lot of study. It is well-formatted, a great version, and has little to be improved on. I received my Set of Scriptures ( Lockman NASB Side-Column Wide Margin Reference Black Gen. Leather, today 2 August 2018. I ordered it on 30 July 2018. 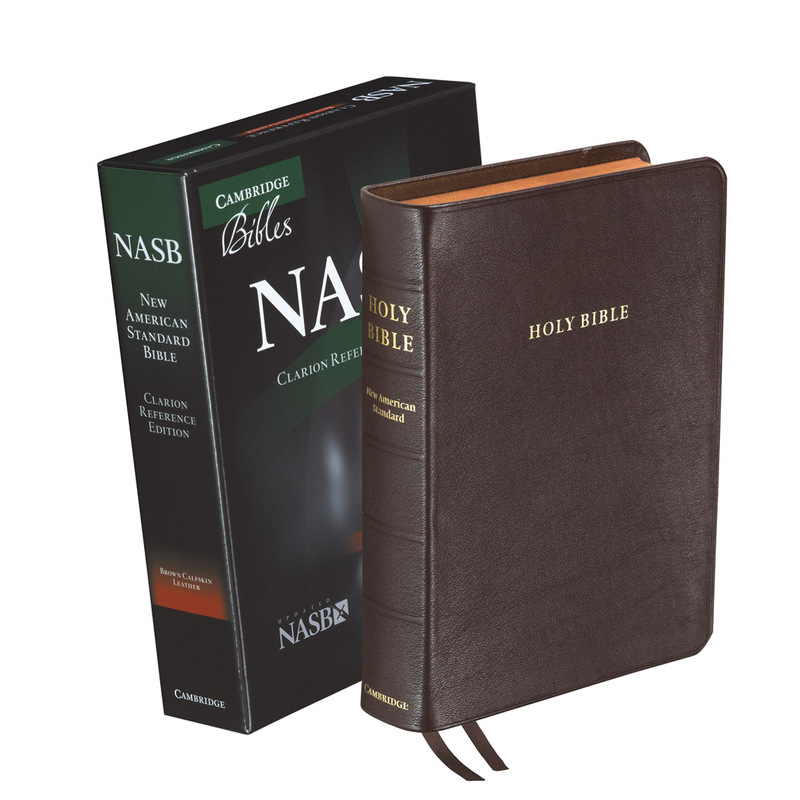 I would like to say I have a few NASB’s , I mainly use King James Versions, mainly I was reared on them from a Lad. But the Folks had said their were other versions. They were Church of Brethren. I find that this copy of Scripture is constructed very well and the cream color page sets off the dark black print of the Text. The Font Size is just fine as I have eye problems and the side margin references are not that bad, I have seen worse. My wife and I have a nice library of Bibles , all different versions and translantions. This NASB will be a welcome addition to our collection of our Word Of God. I know after my cateracts (sp) will be removed I will not have to use my glasses to read. The leather binding is extremely smooth and was easy to break in. My mother being a Librarian showed us kids always to break in a bible ( you can find it on you tube) they will last longer. The Ghosting is not bad and bleed through is minimal. I think all Bibles and Books have that problem. I use Crayola Pencils I get from the grocery store so that solves the bleeding through. All In All I think this Bible is a terrific addition to the Word of God , and I am expecting to spend many happy hours studying and learing from it.